The recommended solution(s) are in addition to having a suitable footbed. It is also recommended to buy boots that are fitted by a professional boot fitter. It is assumed that you already have a good footbed. For Ski boots this would be a custom made ‘Conform’able’ or similar. For Snowboard boots this would be a ‘Superfeet’ or similar. In any case, these recommendations will always help. 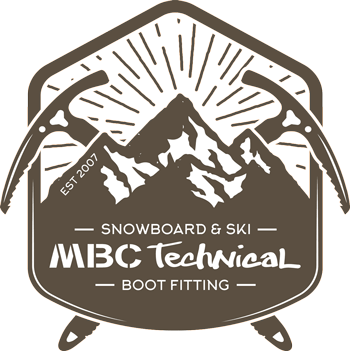 To get the best Comfort, Fit and Performance from your boots, a custom footbed is essential in ski boots. Snowboard boots really should have an additional footbed such as a ‘Super Feet’ or custom snowboard footbed in place of the original. Custom ski footbeds can be great in snowboard boots too but due to the more dynamic nature of snowboarding these are not always suitable for everyone. Manufacturers do not put the best footbeds in their boots as it makes them more expensive. Some people can also find too ‘aggressive’ footbeds uncomfortable and therefore a more custom approach is needed. An example of this is someone with very flat feet who could find any arch shape in the footbed uncomforable. A podiatrist would be able to make a more corrective footbed that ramps the whole foot from the forefoot to the rear foot. If you already wear orthotic footbeds made by a podiatrist then you should consult you podiatrist about wearing wintersports footwear. Often however, if it feels good then it is ok and a good instore boot technician can still help you here. For example, a custom made pair of footbeds can still be made for you and because you only really wear your ski boots for relatively short periods of time there will not be any real negative effects if they have been made as normal by an experienced boot technician.. When trying to diagnose a problem with your boots, it is often that a symptom you have is not where the problem lies. If you go to a good Snow Sports Retailer they should follow a few standard proceedures. This involves checking all the 3 components and recommending a suitable footbed which is essential in order to stabilise your foot. A great way to pin point where you have a problem is to wear your boots standing for a good 5 minutes. When you remove your boots and socks you will have red marks where ever you have had pressure. A boot technician might use this trick to acurately locate an area of pressure.